This past week was the first series of shows with the crocodile hunter's lambs. He has worked hard raising and training them to be ready! We found out that they were siblings, two of a set of triplets. The female sheep weighs in at 96 lbs. now, and the male hit 125 lbs. This is only the second time he has sheared the sheep. I have a large bag of wool from the first shearing, and we are hoping to try out a little hand carding! The little ones get the chance to practice in the Peewee showmanship round, so Dimples took a turn leading one of the sheep through the ring, with big brother close at hand - that animal outweighs her by about 70 pounds! Finally, the crocodile hunter's turn to show - his ewe lamb received first place in her class at county and regional, and his wether earned a second place ribbon for county and sixth place at regional. 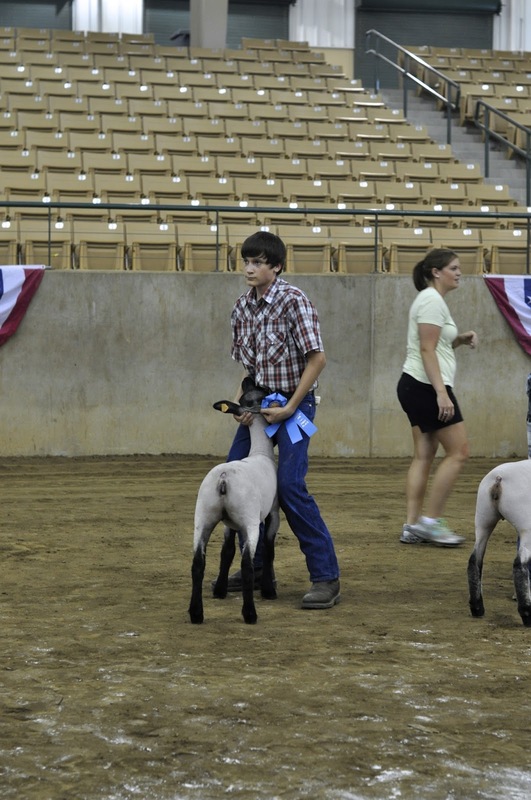 It is amazing to watch these kids go into the ring with no halter and lead the sheep around just by hanging on to their neck! In Catechesis formation, we spend some time talking about sheep, to better understand why Christ so often uses them as a parable for us, and last year we read A Shepherd Looks at Psalm 23, but I have to say, seeing these animals first hand certainly drives home the many lessons of being called a sheep in the Bible! They are some of the most hard headed and stupid animals, and truly need a great deal of care and attention :) Thank God we have such a patient heavenly Father to love and care for us! Thanks for posting. So fun to see the fruits of his summer labors! Thinking often of all of you lately.